Laser hair removal and skin rejuvenation treatments. 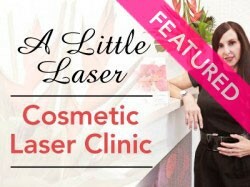 Jennifer Dromgold is the owner of A Little Laser in Manuka. She provides safe, fast, high end medical grade treatments at affordable prices. Hair removal and skin rejuvenation treatments for people of all skin types. Jennifer’s experience in providing clinical and laser treatments spans over 10 years. Jennifer has been specialising in helping people in the Gay, Lesbian and trans* community who need a professional clinic that understands their needs.